Please use the drop down menu above to access my projects archive. Subscribe to my newsletter to stay informed about my latest news and projects. My Stamp Collection block uses a piece of lightweight fusible interfacing to quickly piece 100 tiny squares into a 15” x 15” block. This method helps to keep seams straight and makes a block with reinforced seam allowances that “stay put” making them especially easy to handle and sew into a larger quilt. Although my process is my own, using interfacing to piece little squares isn’t something I invented. Quilters have been doing this in various forms since at least the 1990’s and it’s been especially popular among quilters making Impressionism-inspired Watercolor Quilts. In fact, there are gridded interfacing products made specifically for this purpose (more on that below). My favorite thing about this method is that it allows me to carefully arrange a bunch of squares “just so,” fuse them in place, and then sew them together without having to keep track of which row is which or which square went where. Making multiple blocks using this technique makes it possible to create a quilt with more varied blocks than one would get using strip piecing (which necessarily involves repetition in the arrangement of the fabrics). When I first tried piecing with interfacing, I was concerned that it would make a quilt that was overly stiff but, after having my green and black gingham quilt around for a couple of years and numerous washes, I’m happy to report that it’s actually quite snuggly. I think that having the sashing between the interfaced blocks probably helps. Each block is made with 100 squares a scant 2” x 2” each. 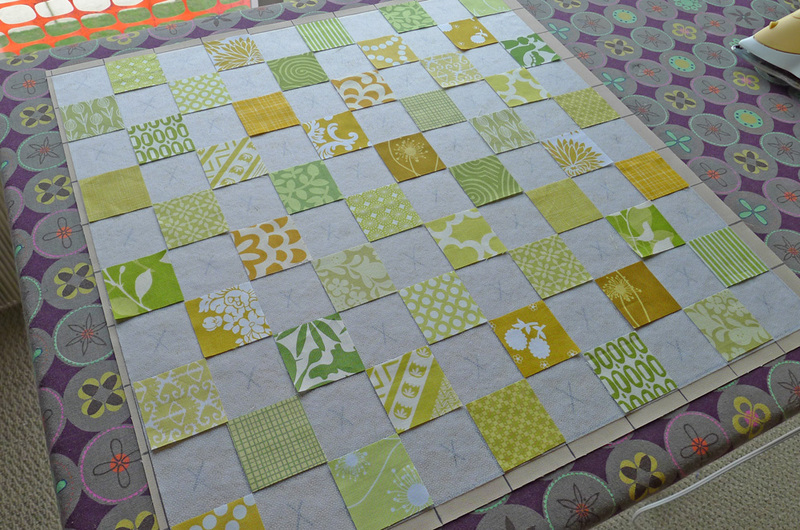 I used 50 squares each in 2 color groups (yellow/green and gray). Within each color group, I used 2 squares each of 25 different fabrics. This means that there are 2 of each print in each block, which could make a fun matching game/I Spy quilt for a child. When cutting your squares, position the line on your ruler so it is just outside (rather than on top of) the edge of the fabric, resulting in a cut square that is just a touch smaller than 2”. Don’t go crazy here. We’re only talking about a few threads smaller but, when you go to arrange the squares on the block grid, having them be a scant 2” x 2” will make a huge difference in how easily your block comes together. Have fun fussy-cutting your favorite picture prints, but make sure they have room to breathe by also including some more basic monochromatic prints and/or solids. For each block, you’ll need a 20” x 20” square of lightweight fusible interfacing. The Pellon JAS interfacing I use is exactly 20” wide, making it super-easy to cut to size. After trying many products, including gridded interfacing designed for this kind of piecing, I find that I prefer to use a lightweight fusible designed for apparel sewing. I just had too many problems with the quilting-specific grids crinkling and ripping. Instead of drawing a grid on the interfacing, or using interfacing with a grid already on it, I made a reusable grid that I can lay under the (translucent) interfacing while I’m arranging the tiny squares. For this, you’ll need a piece of muslin or other solid scrap fabric at least 21” x 21”. Press this fabric, using starch or Best Press if you have it, until it is completely flat and free from wrinkles. 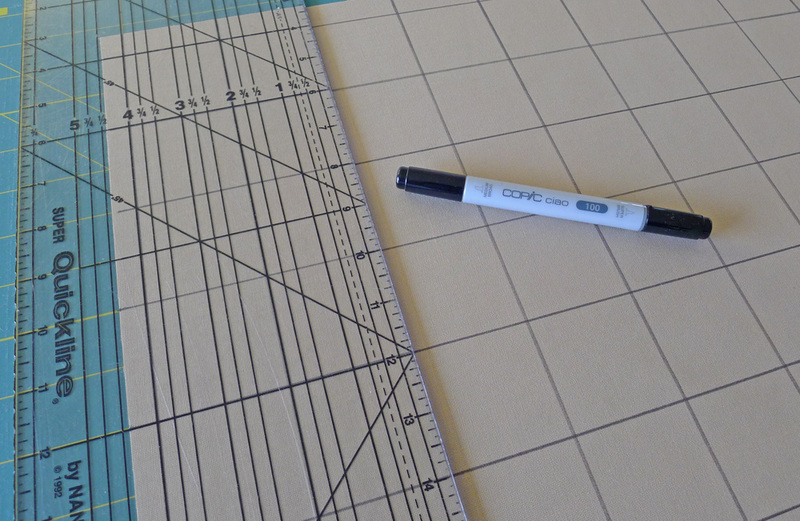 Lay the pressed fabric on your 24” x 36” cutting mat and use a permanent fabric marker and the lines on the mat as a guide to draw a 20” x 20” grid made of 100 squares, each 2” x 2”. If you’re planning a checkerboard design with two color groups (like my blocks) mark an “X” in every other square. This will make it easy to keep track of which color goes where. I used a Copic marker to draw my lines. If you don’t have a permanent fabric marker, a Sharpie will also work, but it may be fume-y during the block making process. The marker will probably get on the ruler so, if you have a metal drafting ruler or an older quilting ruler, use that instead of your good 6” x 24” ruler. Before using any marker on top of your good cutting mat, test in an inconspicuous place to make sure no bleeding will occur. You’ll need a flat, sturdy pressing area at least as big as your muslin grid. Ideally, this would be a pressing table or board made of plywood wrapped in batting and fabric. Cutting the seam allowance open is probably the least fun part of this process, but it’s a lot easier with the right scissors! I found that my dressmaker’s shears were too big to open the seams efficiently. For the blocks shown in these posts, I used 5” paper cutting scissors. Their super-sharp point slid into the seam allowance easily, and the handles were relatively comfortable to hold (which is important, because there’s a lot of cutting to do). If I were making the blocks today, I would probably use my Kai Embroidery Scissors. The following instructions make a couple of references to which hands I used for different parts of the process. I’m right handed. If you’re left-handed, you’ll probably find it easier to do the opposite of what I recommend. 1. Place your muslin grid on your pressing board, smoothing it out and making sure none of the gridlines are warped. 2. Carefully place your interfacing on top of the muslin, with the glue side facing up, lining the 20" x 20" interfacing up with the the 20” x 20" grid. Note: If you find that your interfacing is too small to fit on your grid, it’s likely that you drew the grid too big. I suggest remaking your muslin grid, being especially careful to use the lines on your mat (rather than a ruler alone) to draw the grid. Keep in mind that the marker lines may be as much as 1/8” wide, and that may be what’s throwing off the size of your grid. 2. Add the 50 squares from your second color group, placing them in the remaining, X-marked spaces. The scant 2” squares should fit into the marked spaces without overlapping. 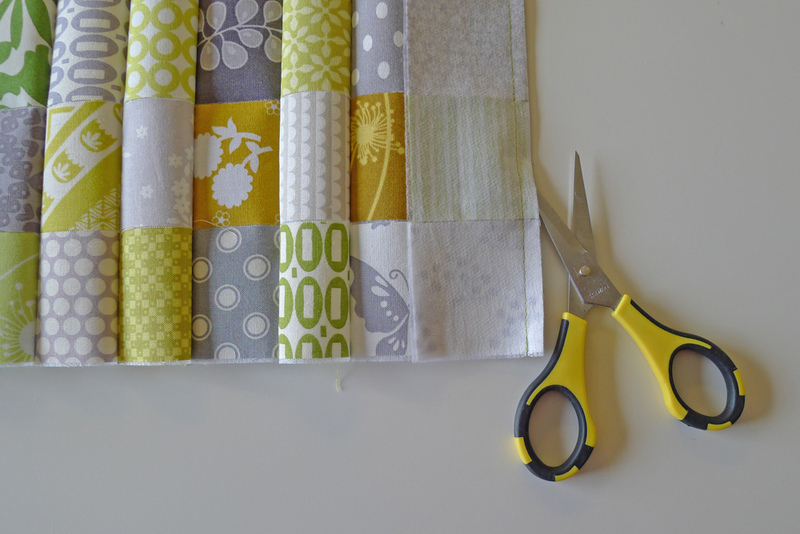 If you find that your squares overlap, trim them slightly so that they comfortably fit side-by-side. 3. Once all of the squares are in place and every part of the interfacing is covered, carefully press the squares from the top, being careful to pick up and set the iron, rather than pulling it from side to side. Repeat this process until all of the squares are securely fused to the interfacing. I found that pressing as I normally would (on a cotton setting with steam) worked well with the interfacing I used. However, consulting the manufacturer directions for the interfacing you’ve chosen is always a good idea. 1. Carefully fold the block along each vertical seam, pressing to make a crease. As you work, pay attention to how the squares in the rows you’re folding over line up with the other squares in the block. If your seams are straight, the squares in one row should lay right on top of the squares in the next. 2. Sew each vertical seam, using a 1/4" seam allowance and backtacking (sewing backward and then forward again) a couple of stitches at the beginning and end of each seam. As you sew, concentrate on keeping each seam straight, particularly at the beginning and end. 3. The seam allowances are now held together by the interfacing and will have to be cut open before they can be pressed. Use a small pair of scissors to carefully cut open each seam allowance, trying as much as possible to cut only the interfacing. 4. Press each seam allowance open. I found it helpful to open each seam allowance with my left hand as I pressed it, holding the iron in my right hand. 5. Before you move on to the next step, remove any strings or bits of fabric caught in the seam allowances. In particular, you’ll want to remove any fabric that was cut away from a square during the process of opening the seams. 1. Carefully fold the block along each vertical seam, pressing to make a crease. Once again, pay attention to how the squares in each row line up, pressing a crease only when the seams are straight. 2. Sew each horizontal seam, using a 1/4" seam allowance and backtacking at the beginning and end of each seam. As you sew, work to keep your seams straight and be careful that your seam allowances aren’t getting pulled askew by the machine’s feed dogs. 3. Use your small scissors to cut open each seam allowance. I found that it was helpful to pinch the seam allowance with my left hand while I cut it open with the scissors in my right hand. 4. Press the seam allowances open and remove any strings or loose bits of fabric. Your block should now measure 15½” x 15½” (so it will be 15" x 15" finished). All original content ©2008-2019 by Elizabeth Hartman. All rights reserved. Please refer to my Terms and Conditions for details. Thank you!